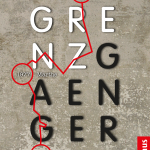 On March 20, the German publishing house Urachhaus published Grenzgänger, the German translation of Grensgangers. The book was translated by Eva Schweikart. On the occasion of 30 years Fall of the Berlin Wall, I wrote an afterword about what the Berlin Wall means to me personally.